The North Island of New Zealand is the most populated island in the country hosting a population of 3,519,800 people. 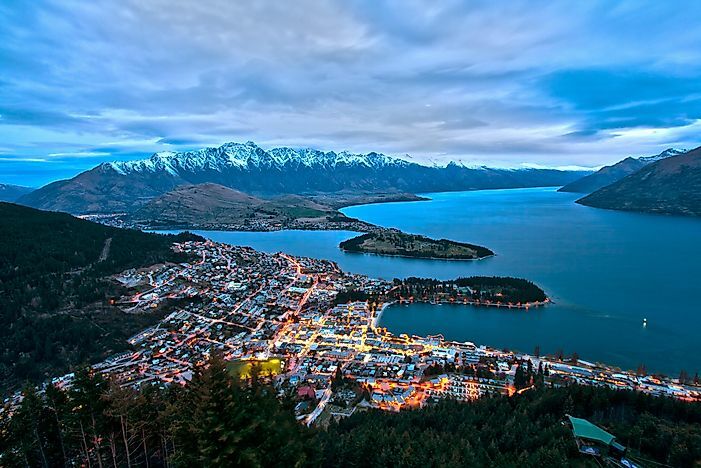 Queenstown, a resort town located in New Zealand's South Island. The New Zealand is formed up by the two islands mainly the North Island and the South Island, which are separated by the Cook Strait by 22km. New Zealand lies in the center of water hemisphere, which is in the Southwestern Pacific Ocean. The largest land mass of New Zealand is shared by the South Island. The country has a temperate and mild maritime climate. The mean temperature ranges from 10 degrees C to 16 degrees C. The weather conditions in New Zealand changes sharply from the west coast to semi-arid in Central Otago. The human population of New Zealand according to the census is 46,99,800 with a density of 17.2/km2. The North Island of New Zealand is the most populated island with a total of 35,19,800 people. Second is the South Island with 10,76,300 people and the third is the Waiheke island with the population of 8900. The North Island with the area of 113,729km2 is the 14th largest island in the world. The population density of the place is 30.9/km2. The island hosts around 77% of the country's population. The major reason for this huge population is due to the migration of people from other parts of New Zealand to the North Island due to better economic and infrastructural facilities. North Island’s sub-national GDP contributes 79% of the total national GDP. The source of livelihood for people there mainly depends on international trade and export. The rural areas are dependent on agriculture and dairy, but the urban population is dependent on trade. South Island is a second populous island where a major portion of the population is dependent on tourism. Apart from this, a large section of the population also practices agriculture. The other major sources of earning come from manufacturing, construction, mining, education, energy supply, and health and community services. Waiheke Island is the third most populous island with the population density of 96.7/km2. People are dependent on the coastal areas because the island is majorly surrounded by water. There are excellent beaches and fertile lands that contribute to people’s income through tourism and agriculture. After the formation of the European Union, there has been a decline in the trade sector, which affected the livelihood of people there. As of 2012, the unemployment rate was 6.7%. In New Zealand, the population trend is more likely to bend on the urban side. Presently, 72% of the country's population lives in the 16 urban areas in the country. This trend is likely to prevail in future because of the economic growth in New Zealand. With the rise in human population, there has been a sharp decline in biodiversity and many animals and birds of the country have become threatened. Hence, sustainable development is necessary to conserve the unique biodiversity of this country.